Ever since Julius Caesar’s legions conquered Gaul, opposing armies have built temporary fortifications, or fieldworks, during campaigns in the open countryside. In the modern age, such fieldworks were perfected first during the Civil War. Civil War fieldworks were actually trench systems, and were much more complex than a mere trench made by excavating material and tossing it out in front of the trench. Fieldwork systems included cleared fields of fire, obstructions, and barricades, and outer works in front of the breastwork proper, together with gun positions, redoubts, covered ways, and other protective features on the defenders’ side of the line. When built under fire, the initial line of fieldworks was often selected by regimental field and line officers, and construction was supervised directly by them. It was not uncommon for engineer officers to later adjust portions of the line to better positions. Non-engineer officers also sited works at isolated posts. The majority of fieldworks were constructed by rank-and-file enlisted men wielding a variety of specially designed and improvised hand tools. A small number of men in each company might be designated as pioneers, temporarily assigned to fatigue duties such as fieldworks construction and road work. Pioneers were not permanent units, and men were selected for such details because they were good ax-men or possessed other construction-related skills. Some common—but not the only—features of a Civil War fieldworks system included rifle pits, abatises, chevaux-de-frise, ditches, embankments, parapets, breastworks, tren-ches, revetments, head logs, traverses, sally ports, redans, lunettes, and redoubts. Rifle pits varied in size, from what might be called a foxhole to complete fieldworks. Most were advanced fieldworks meant for pickets, usually hundreds of yards in front of the main line. To be sure, 1863 was a pivotal year for fieldworks in the eastern theater of the war. Federal troops constructed many slight to moderate works during the Chancellorsville campaign that May, and moderate works were built on Culp’s Hill, Little Round Top, and along Cemetery Ride at Gettysburg. By November of 1863, fairly extensive fieldworks were constructed during the Kelly’s Ford, Rappahannock Station and, Mine Run campaigns. In the spring of 1864, the Battle of the Wilderness saw extensive construction of moderate works, and following the Battle of Spotsylvania that May, the opposing armies of Ulysses S. Grant and Robert E. Lee perfected the art of fieldworks during the 10-month siege of Petersburg. Fieldworks were defended with everything their occupants possessed. Officers would order the men massed in the works to fire when the enemy was well within range—typically at less than 300 yards. Musketry at that range was murderous, particularly later in the war. After an opening volley, most of the firing was at will, as fast as each defender could load and fire. If the enemy was able to reach the works and the defenders stood their ground, close-in combat took place with bayonets, clubbed muskets, and even fists. Because traverses were a common component of fieldworks, breakthroughs were often contained to a fairly small area. Often, it appeared to the attackers that the enemy works were deserted—not a man could be seen in them as the assaulting force approached. But as soon as the enemy skirmishers disappeared back into their own lines, hundreds of flashes from enemy muskets became visible, followed by puffs of smoke and whizzing bullets. 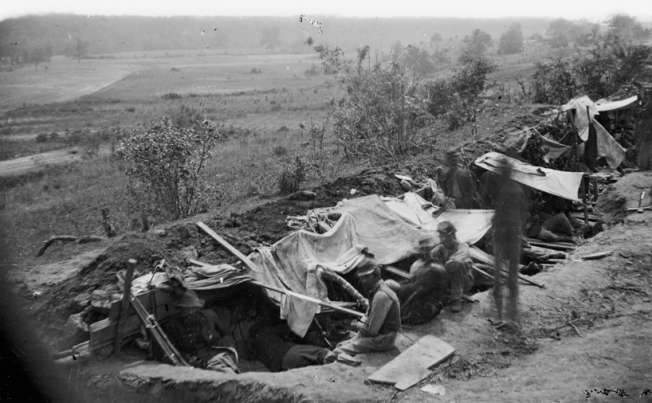 Troops attacking stoutly defended earthworks were often unable to reach them at all, and were pinned down in no-man’s-land until they were able to withdraw. Troops pinned down sought cover by any means possible, placing their knapsacks or blanket rolls in front of them, hiding behind cover—including dead bodies—and digging shallow rifle pits. If the assaulting columns were able to penetrate the enemy position, the resulting fighting was typically brutal and bloody. In the end, attacking Civil War fieldworks was almost always an extremely costly enterprise. Tags Battle of the Wilderness, civil war, civil war soldier, civil war soldiers, Culp's Hill, Features, Fieldworks, Gettysburg, gettysburg campaign, Rapidan River, Robert E. Lee, spotsylvania, Ulysses S. Grant, union soldier. Do cheap heels hurt your toes? This is something I’ve been wondering about. but could it be really worth it? Something take into consideration.. In the beginning of the war most of the armies did not use fortifications unless it was to protect a city or important place. The generals thought that their men would not attack from fortifications and they were all trained in offense not defense. Also there was a feeling that fighting from behind fortifications was not manly. As modern weapons proved how deadly they were the men dug fortifications or got behind walls. Even a wooden fence could protect the men somewhat. Lee built fortifications to protect Richmond but only to free up men to be able to attack the Union army. Fortifications allowed him to use less men to defend than would have been needed without them. The Confederates did not build fortifications until Mine Run, although they did use the unfinished railroad at Second Mananas and the stone wall at Fredericksburg. The Union fortified Washington and Nashville but did not really build field fortifications until Chancellorsville. At Gettysburg they could not dig in in most places but there were already stone walls they could hide behind or lots of logs and stone available where there were not walls already. By the end of the war both sides dug in when they stopped for the night and if you gave them two days the position was almost impregnable. At least until the Confederate armies were so decimated that the Union army did not have to worry about fortifications.